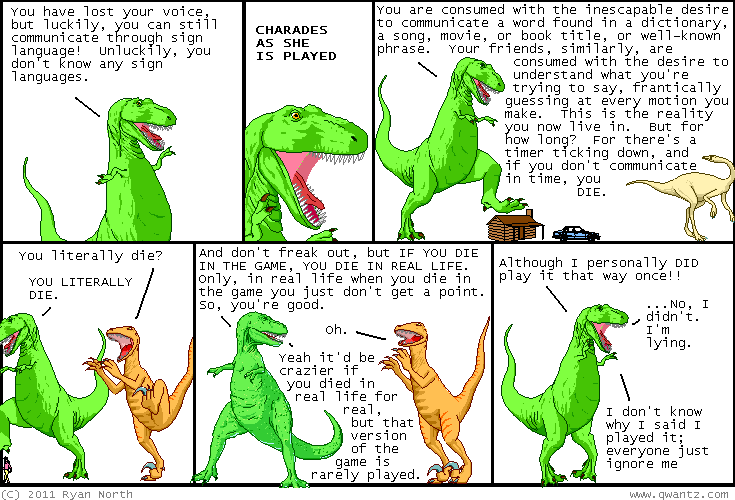 Dinosaur Comics - December 15th, 2011 - awesome fun times! Feel Free To Talk To Me If I'm Wearing A Dinosaur Comics Shirt Day! starts at the stroke of midnight and goes all day long. If you're single and you'd like to meet someone who maybe reads the same comic as you, THIS IS YOUR CHANCE. If you've got one of my shirts, wear it, and if you don't have one, you can keep an eye out for someone who does! And if something awesome does happen, please email me about it: it'd be totally amazing if everything works out. Finally, at 7pm is my combination holiday party / book release party for my new book! We're doing a secret Santa gift exchange and Joey Comeau is gonna ask me personal questions on stage. SHOULD BE FUN?? Also all shipping deadlines to Canada have passed, so this is a great chance to get the book (signed, if you want! I will sign... ANYTHING) for someone. Okay that concludes your Monday the 19th of December schedule for this year!